I couldn’t make just one panini recipe. The only real recipe part is how to make the dough and then how to make it work in a panini press. The toppings and variations are endless so I’m sharing my favorite two with you. A Turkey Cheddar Chipotle Panini and a Pepperoni Pizza Panini. I love my panini press. One of our favorite meals is to make a big pot of soup and set out the panini press, breads, and toppings. We’ve done this with company, on holidays, and for parties. It is always a hit. If you like to entertain getting a cheap $40 panini press will make hosting gatherings so much easier. Trust me. This is my current Hamilton Beach Panini Press. I had a Krups one first from Williams-Sonoma. My husband and I tried to buy a condo a couple years into our marriage. About two weeks before closing it fell through. We were really bummed so we each got to pick a consolation prize. I bought a panini press and he bought a humidor. That first panini press lasted almost 10 years with occasional use. When it died he got me this one for Christmas. I haven’t used it much until now since I’ve been doing Trim Healthy Mama. Paninis need gooey cheese. So for THM they need to be an S meal (low carb). I haven’t found a low carb bread I liked enough to try. But I had an inkling that using a mozzarella dough could work. And I was right! Put mozzarella cheese and 2 oz of the cream cheese in a microwave safe bowl. Microwave one minute. Stir. Microwave 30 seconds. Stir. At this point all the cheese should be melted. Microwave 3o more seconds until uniform and gloopy (it should look like cheese fondue at this point). Mix in the egg and baking mix. You will need to dump it onto wax paper and knead it by hand to thoroughly incorporate the ingredients or you can do this in a food processor with the dough blade. Press the dough out on parchment paper into a piece about 8 x 11 inches. Preheat panini press. This only takes a few minutes. 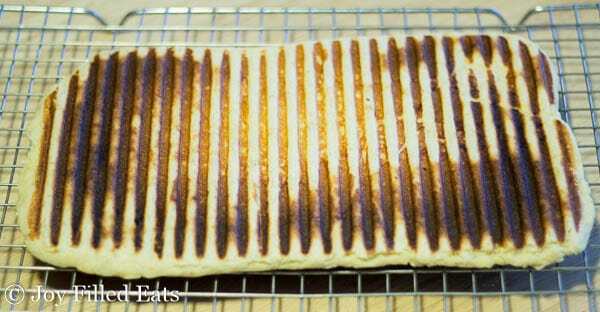 Spray the panini press with cooking spray and carefully put the dough on the press. Close the lid. Cook for about 5-7 minutes until the dough is golden. Remove and cool. Cut into 3 or 4 pieces. Slice each through the center. The dough in the center is still undercooked. 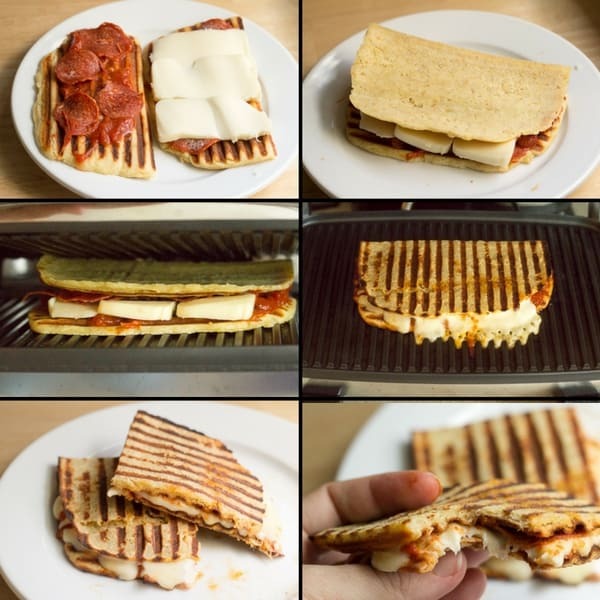 By slicing it through the center and inverting the pieces to make the sandwich you can completely cook the dough on the panini press. 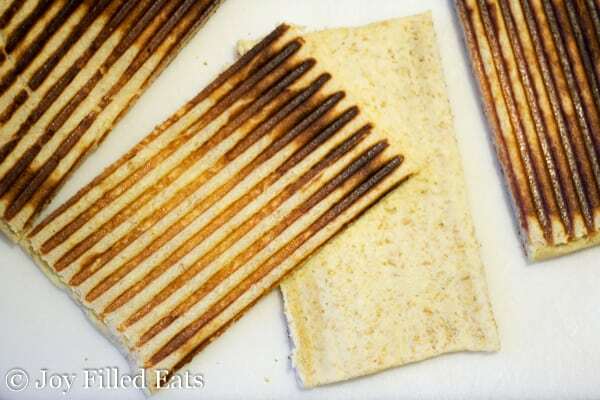 Fill with your choice of panini fillings and grill again with the uncooked dough out. Two of my favorites are below. P.S. I have only tried this in a panini press. I have not tried it in the oven, grill, toaster, or stove top. Sorry. I think it would work to bake the dough, then split it and use it like you would for a grilled cheese sandwich. Chipotle Mayo: Blend one can of chipotles in adobo. (This stuff is potent. I use a tiny bit in each recipe and freeze the rest in an ice cube tray for the future). Mix 2 tbsp mayo with 1 tsp chipotle puree and 1/4 tsp garlic salt. You can add more chipotle puree and garlic salt to taste. I like mine only slightly spicy. I’m a bit of a wuss in the spiciness department. Take one piece of grilled dough and slice it in half through the center. Spread some of the mayo on the grilled side. Top with a few slices of deli turkey, white cheddar cheese, and spinach. Put the top piece of dough on with the lines down. 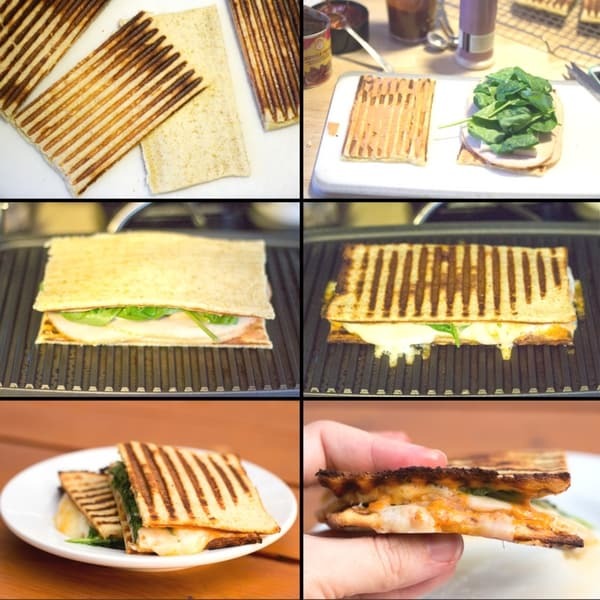 Put the sandwich back on the panini press and grill until the cheese is gooey and the fillings are hot. Take one piece of grilled dough and slice it in half through the center. Spread some tomato sauce on the grilled sides. Top with a few slices of pepperoni and mozzarella cheese. Put the top piece of dough on with the lines down. Put the sandwich back on the panini press and grill until the cheese is gooey and the fillings are hot. Turkey Cheddar Chipotle Panini: Chipotle Mayo: Blend one can of chipotles in adobo. (This stuff is potent. I use a tiny bit in each recipe and freeze the rest in an ice cube tray for the future). Mix 2 tbsp mayo with 1 tsp chipotle puree and 1/4 tsp garlic salt. You can add more chipotle puree and garlic salt to taste. I like mine only slightly spicy. I'm a bit of a wuss in the spiciness department. Take one piece of grilled dough and slice it in half through the center. Spread some of the mayo on the grilled side. Top with a few slices of deli turkey, white cheddar cheese, and spinach. Put the top piece of dough on with the lines down. 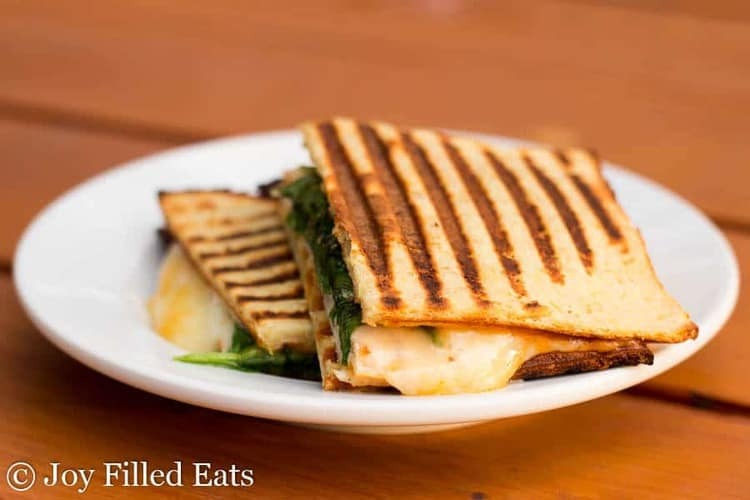 Put the sandwich back on the panini press and grill until the cheese is gooey and the fillings are hot. Pepperoni Pizza Panini: Take one piece of grilled dough and slice it in half through the center. Spread some tomato sauce on the grilled sides. Top with a few slices of pepperoni and mozzarella cheese. Put the top piece of dough on with the lines down. 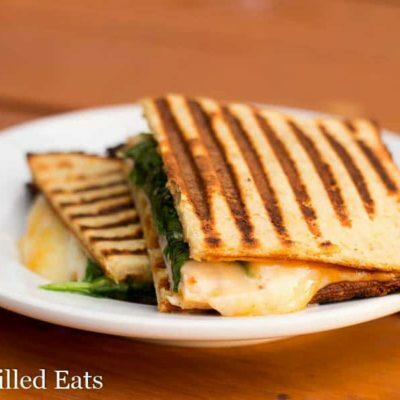 Put the sandwich back on the panini press and grill until the cheese is gooey and the fillings are hot. Any way of melting the mozzarella besides using a microwave? Would stovetop work, maybe double boiler? Yes, low heat on the stovetop works. Does the bread keep for later use? If so how long do you estimate it is good for. thanks. It is fine for a few days in the fridge. I haven't tried freezing it yet. Not really. But if you are concerned you can use more almond flour. Thank you for replying. Love your recipes. Is there a way to use this recipe but cook it with a normal oven or stovetop? I have no panini press but it looks yummy. I think it would work to bake the dough, then split it and use it like you would for a grilled cheese sandwich. What keeps the bread from browning on both sides the first time you cook it? It does brown on both sides but the center doesn't cook through. So you slice it through the center and put the raw dough on the outside when you make the sandwich. When you grill the sandwich the dough finishes cooking. Do you have a trick for slicing the "bread" through the center? It seems like it would be difficult to slice something that is already thin. Looking forward to trying paninis! It's actually really easy to slice. I think because the outside is crusty but the center is still doughy. I used a serrated knife and it slid right through.